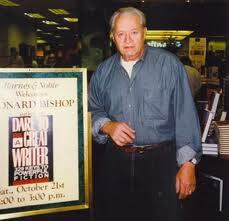 (There are several writing groups around the country who began with Leonard Bishop. Each of us writers and dreamers are thankful to him every time we sit down to our desks, or curl in front of a fire to “percolate” our ideas for our next work. This entry was posted in Inspiration, nostalgia, Writer's Hint, Writing, writing a novel, writing group, Writing Techniques and tagged American Novelist, best American novelists, Dare to Be A Great Writer, inventiveness, Leonard Bishop, self-expression, surviving as a writer, taking risks in writing, thankfulness, Thanksgiving, writing inspiration, writing talent, writing technique. Bookmark the permalink.